Innovative projects are something of a tradition at Stuttgart Airport: Echterdingen is home to several fuel cell airplane models, Baden-Wurttemberg’s first public hydrogen filling station set up in 2009 and hybrid technology field tests since 1991. The most recent project involves field-testing six electrically powered buses for regular day-to-day use. 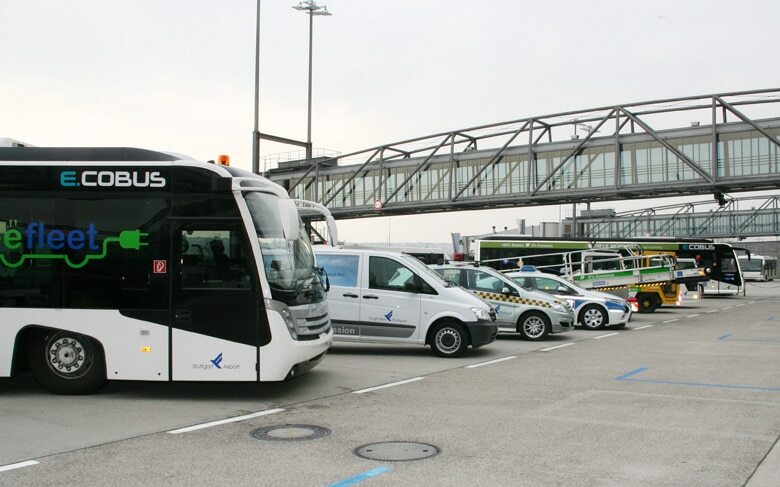 On Oct. 13, 2015, Stuttgart Airport presented its new electric bus fleet, which is expected to provide “more sustainable” passenger transportation around the airfield. At the same time the World of Energy Solutions took place on the nearby trade show premises, Professor Georg Fundel, CEO of Stuttgart Airport (FSG), inaugurated the first eCobus 3000 together with Winfried Hermann, minister of transport and infrastructure of the state of Baden-Wurttemberg. The eCobus 3000 is one of six electrically driven buses of the Cobus brand used across an airport’s maneuvering areas and aprons. The three-meter wide bus can carry up to 112 passengers and possesses a lithium-titanate battery (95 kWh) offering a rated capacity of 160 kW. Cobus Industries, known as one of the leading manufacturers of buses used at airports, also supplied Stuttgart Airport with the other six vehicles, which are still running on diesel. The new buses, however, will reduce energy demand per passenger by around 80% compared to the diesel version, saving more than 22 tons of CO2 each year. The technology was thoroughly put to the test at the airfield before positive results made it the world’s first electric airport bus employed in day-to-day operations. FSG receives 40% of the additional costs incurred compared to diesel-run vehicles from Baden-Wurttemberg’s state initiative Electric Transportation II. The set-up of new filling stations as well as the power infrastructure was also supported by subsidies: The European Union and the Federal Ministry for Economic Affairs and Energy contributed more than half a million euro to the project. During the presentation of the new electric buses, Fundel‘s team also showcased another six electrically driven off-highway vehicles, which are thought to jointly provide clean transportation around Stuttgart Airport. Both the buses and a baggage carousel run on electricity, while a pushback vehicle (model F110) that operates on battery power moves the jets out of their parking spaces. All of them are part of the e-fleet program. Additionally, there is a fuel cell car (Mercedes B-Class F-CELL) which has already been in use in Follow Me mode since 2010, an electric van (Mercedes Sprinter) for airport transports and a hybrid vehicle (Opel Ampera) for airport police, as well as two electrically driven baggage tractors.